In the last years, the tide of globalization has reached an unprecedented degree as firms increasingly expand beyond their national borders. The success and failure of these companies is dependent on more than just management of economic and legal barriers but also cultural ones. Firms are increasingly aware of the necessity of intercultural communication. Recognition of the importance of developing intercultural skills is closely tied to the need of the corporations to succeed globally and the demand of managers with the capability of interacting with people from countries other than their own. With a globally interdependent economy, differences in cultural traits and backgrounds often cause misunderstandings and unintentional sights. Clearly, the diversity and dynamism of today’s market place calls for managers with diverse skills to lead teams beyond national boundaries (Gudykunst, 2005; Hampden-Turner & Trompenaars, 2000; Landis, Benett & Benett, 2005). According to Jandt, characteristics of an effective communicator are: “ Self awareness (using knowledge about yourself to deal with difficult situations), self-respect (confidence in what you think, feel and do), interaction (how effectively you communicate with people), empathy (being able to see things from different points of view), adaptability (how fast you can adjust to new situations and norms), certainty (the ability to do things opposite to what you feel), initiative (being open to new situations), and acceptance (being tolerant or accepting unfamiliar things)” Jandt 2004, p. 48). Cross-cultural code switching competency is an indicator of an effective communicator. Specifically, encompasses more or less the above named characteristics and expands on the role of emotions when switching. Molinsky’s model of psychological toll illustrates the determinants of cross-cultural code-switching and the psychological challenges faced by an individual during performance. The model provides an excellent foundation for investigating how international organizations can tailor trainings for global leaders. In this paper, I refer to global leaders as expatriates in management positions. A case study on the movie outsourced exemplifies how organizations can foster and create leaders who can cope with the complexities of cross-border relations. Code-switching occurs when people alternate the use of languages when interacting with others in a given situation (Myers Scotton & Ury, 1977). Molinsky defines cross-cultural code switching as “the act of purposefully modifying one’s behavior in an interaction in a foreign setting in order to accommodate different cultural norms for appropriate behavior” (Molinsky, 2007, p. 624). 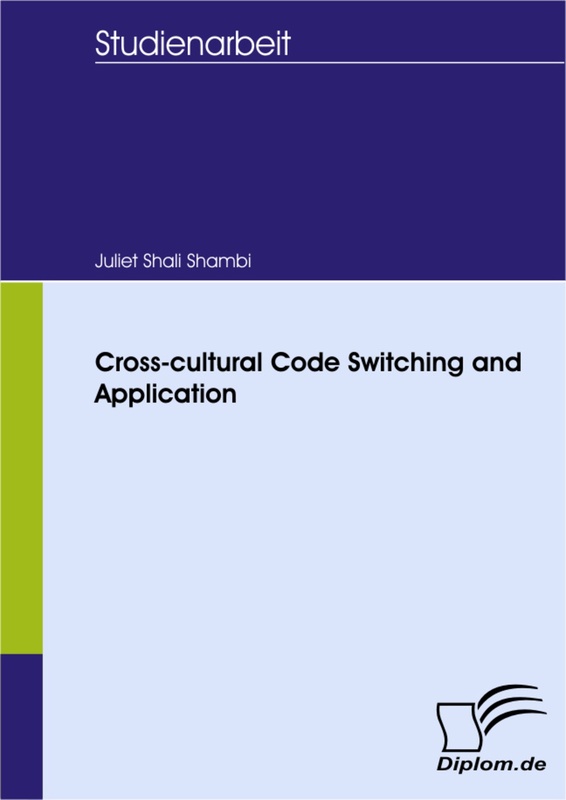 In other words, cross-cultural code switching involves deviation from one’s cultural norms to another for the purpose of behaving in an expected manner in a foreign culture while code switching involves switching from one language to another. The capability to switch could also be referred to as adaptation of foreign behavior (Molinksy, 2007). According to Benett & Benett, “adaptation occurs when we need to think or act outside our own cultural context” (2004, p. 156). Furthermore, having a diverse behavioral repertoire and knowing when to adapt is referred to as flexibility of one’s behavior (Spitzberg & Cupach, 1989). According to Hall, culture influences communication and communication influences (Hall, 1979). It is cultural differences that determine how communication is perceived by different people when interacting. These interactions occur often in business meeting, conflict resolutions, and negotiations, among others in the international business settings. For example, managers that pursue foreign assignments should be in a position to adapt for successful interpersonal communication (Koester & Lustig, 2006). A Japanese, an African, or a German, for example would learn to communicate like other Japanese, Africans, or Australians. However, Molinsky addresses the challenges people face in cultural adaptations. Three psychological states influenced by contextual and personal variables are explained in his model. These in turn, induce the degree of psychological toll of an individual. Psychological toll relates to exhaustion of psychological resources necessary when individuals adapt by tailoring their behavior to meet the demands of the foreign culture. Hobfall refers to the psychological toll is the erosion of one’s psychological resources leading to difficulties when switching (Hobfoll 2002 cited by Molinksy, 2007). To curtail emotional challenges in cross-cultural interactions, it is proposed that one should adapt to the norms and behavior of a foreign culture (Tung 1984 & Pornpitakpan 1999, cited by Christina Yu Ping et al; 2008). Code-switching can lead to the release of negative or positive emotional arousal (Molinsky 2007; Ting-Toomey, 1999; Tanure, Barcellos, & Fluery, 2009). Negative emotions are expressed as feelings, for instance, frustration, apathy, fear, shame, hatred, anger, hostility among others. On the other hand, positive emotions are for example enthusiasm, interest, empathy, curiosity etc. Molinsky identifies three psychological states that appraise under the influence of emotions while code-switching. These are: “experienced performance difficulty, face threat and identity conflict - all of which mediate the relationship between personal and contextual variables and the negative and positive emotions an individual experiences while code-switching (see figure 1). According to Hofstede (2005), personal values are acquired both consciously and subconsciously from one’s cultural environment in which he is raised. Figure 2 below, reflects how an individual’s cultural values influence his attitudes and behavior in a given situation. Trompenaars (1997) adds that the national culture is represented at the highest level followed by the corporate and professional or ethical culture which is shared within particular functions. These cultural values stem from the variations in perceptions, which in turn influence a person’s capability to switch and communicate effectively. Source: Adler & Gunderson 2008, p. 19. Cultural knowledge is gained from cross-cultural training or experiences in living in a foreign culture. For individuals to be successful in code switching, they must have knowledge and understanding of the foreign culture’s norms and values. There are varieties but related types of knowledge. Namely: linguistic competency – 1) how cultures compose their messages (Chen & Starosta, 1996); 2) reading, speaking and interpretation of the foreign culture (Redmond, 2000); 3) ability to interpret and predict behavior of foreign culture; and, 4) knowledge of effective communication in the business context. The higher the level of one’s cultural knowledge, the easier it is to perform an effective switch. Psychological safety is defined as an individuals’ perceptions on the out-come of risk- taking when code-switching. It is a condition that portrays values and beliefs about how others will respond to respond error discussions, seeking feedback, or sharing new ideas (Edmondson, 1999). A safety psychological environment is one that encourages motivation, confidence, and performance therefore, facilitating cross-cultural code-switching. In such an environment, one believes that the native audience will not resent or think less of them when he puts himself on the line. Therefore, he is motivated or encouraged to perform. However, the native audience does not tolerate mistakes; an individual might not be willing to perform a switch. The degree of psychological safety determines the extent to which a switcher’s face is threatened or validated, leading to embarrassment or pride (Goffman, 1967; Lazarus 1991; cited by Molinsky, 2007). Schein and Bennis (1965) also discuss the importance of creating a safe psychological climate so that individuals feel secure and confident and encourage learning behavior in an organization. Complexity of norms is not only examined on the cultural level but also on the international level. Molinsky’s focus is on the complexity of the variety of episodes in an interaction. His definition of the complexity interactions is “... when expectations for appropriate content, style, and timing of behavior vary significantly across different subcomponents of the same interaction” (Molinsky 2008, pg. 187). Norm complexity results to two psychological states – face threat/ validation and performance difficulty/ efficacy. Differences between the norms of given situation in a foreign culture and the norms of the similar situation in one’s culture is defined as cultural discrepancy. Norms in one’s native culture may be perceived as appropriate culture but questionable or inappropriate in a foreign culture. Consequently, an individual may undergo identity conflict when the foreign norms conflict with ones set of values. Cupach and Imahori (1993, p.113) refer to identity as “an interpretive frame for experience.” The identity of a person stipulates not only how individuals behave and communicate in interactions but also how effective a switch could be performed. Face is may be defined as the way one is judged according to his failure or success when interacting (Ho, 1974). Goffman suggests that face “is the positive social value a person effectively claims for himself by the line others assume he has taken during a particular contact (1955; p. 213 cited by Molinsky, 2007). Molinsky’s proposition 3 (see figure 1), assumes that the complexity of the norms of a foreign culture, the degree of discrepancy between the cultures, and the psychological safety norms created by the foreign audience influence the level of face threat or face validation while switching. On the other hand, proposition 4 suggests that the higher the level of threat/ validation, the more embarrassment/ pride an individual will experience while switching. Difficulty in the performance of an assigned task is experienced when norms between the new and native culture are more complex and discrepant (Proposition 1a). Nevertheless, individuals with high levels of cultural knowledge will experience less difficulty in performing a switch, even though the new norms are complex and discrepant from his home country (Proposition 1b). Consequently, performance difficulty (efficacy) induces positive or negative emotions in the sense that, confidence or anxiety is mirrored in one’s behavior when switching (Proposition 2). According to Molinsky, switching has an effect on individual’s values and identity and hence influences the psychological toll. In order to comprehend a communicator’s state of mind in international interactions, one has to analyze cultural identity (Jameson, 2007; Spencer-Oatey, 2000). Jameson refers to cultural identity as “ an individual’s sense of self derived from formal or informal membership in groups that transmit and inculcate knowledge, beliefs, values, attitudes and ways of life (2006, p. 207). Auerbach (2009) adds that, “an identity conflict erupts when at least one side feels that the other has negated its identity and denied its right as a legitimate player in the international arena”. The capability of an individual to switch is lower if the degree of discrepancy of norms is higher (Proposition 5a). Specifically, if native cultural values conflict with the foreign cultural values, the switcher will undergo a higher psychological challenge than if both cultures were relatively similar. An experienced cultural conflict occurs when the norms of the host country make it impossible for one to act appropriately in a manner that honors his cultural values (Proposition 5b). Various studies have recognized that positive and negative emotions may be towards one own identity or towards another culture’s identity (Jameson, 2007; Molinsky,2007) Propositions 6a and 6b in Molinsky’s model assume that, the greater an individual experienced identity unfit, the more distress, guilt and anxiety he undergoes when performing a switch. On the contrary, the more an individual experiences identity fit, the more contentment and excitement he will experience while switching. Finally, propositions 7a and 7b imply that the more negative emotions one experiences during cross-cultural code-switching, the greater the psychological toll. Whereas, the more positive emotions he experiences the less the psychological toll will be. This assumption makes sense because adapting to differences in language, values, norms, attitudes, rules and systems lead to conflict, frustration and struggle. These conflict-arousing situations are speed with emotions, often negative. Consequently, negative emotions contribute to the depletion of an individual’s psychological resources available in behaving appropriately in a foreign cultural environment. Molinsky’s model is easy to understand and can be used to develop training programs by the human resources department. By meeting the psychological needs of its employees with the help of the model, organizations are bound to increase job satisfaction, performance and employee motivation. The perspective of the model is to determine the effect of cross-cultural code switching on the psychological toll of an individual. 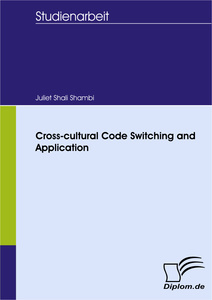 It examines the relationships between different variables that are associated with adaptation and the effectiveness of performing a switch. Molinsky makes the assumption that only the foreigner will switch when he interacts with a native. However, in the business context, natives also tend to switch their behavior to accommodate those of their visitors. Furthermore, he does not mention what occurs when both foreign and national perform a switch at the same time. Moreover, what happens when the switcher is not willing to switch but the native is. The query is: who should switch - the native or the non-native individual?